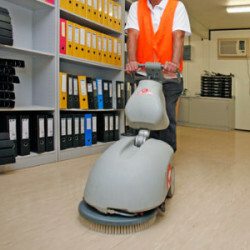 Corporate Clean Property Services provides the full services needed to maintain your vinyl floors. With over 20 years' experience, we have the expertise and experience to maintain your floors in prime condition. From regular cleaning, to scrubbing, stripping, resealing, and buffing, Corporate Clean Property Services can provide you with a customised program to ensure that your floors are revitalised and protected. Vinyl floors can lose their sheen or lustre overtime as the layers of sealer becomes abraded and scuffed by regular daily foot traffic and dirt becomes ingrained. Without the proper maintenance these floors can also discolour further through the use of incorrect cleaning solutions or a build up of wax. If the layers of sealant are allowed to wear away then the surface of the vinyl can become permanently damaged and affect the longevity of your flooring. We use safe, good quality and fast-acting floor stripping solutions that are specifically designed for the removal of floor polishes and sealers from vinyl floors. The stripper solution is applied onto the floor and sufficient time is allowed for the solution to soften the seal or polish. The vinyl floor is scrubbed to remove the old layer(s) of sealer using a slow speed polisher with a stripping pad. The surface is then cleaned, “neutralised” (with a solution containing a PH neutralising additive) and dried, ready for the application of layers of a high quality sealer. After applying multiple layers of sealer, we then buff the surface to produce an “as new” high gloss finish.